At the PHOTOSTOP gallery in White River Junction, bowls, flowers and bottles appear to fall through some of the scroll-like panels in Olivia Parker’s photography exhibit, “Still and Not So Still Life.” The objects’ choreographed tumble is a peculiar convergence of motion and stasis, and the panels represent the culmination of a series that explores the nature of stillness. Parker, a photographer from coastal Massachusetts, has works in the collections of the Museum of Modern Art in New York and the Museum of Fine Arts in Boston, among others. The 21 included in her Vermont show mix straightforward photography and digitally collaged images; all were completed over the past year. Seventeenth-century painters used still life to show off their virtuosity and to communicate moralizing messages. The importance of humility and the temporality of earthly life — compared with presumably eternal life in heaven — were common themes. Parker plays on these conventions, inviting viewers to relish the beauty of each object while hinting at deeper, though not necessarily moral, narratives. Vanitas is a particular genre of still-life painting that warns of the dangers of vanity. In Parker’s “Vanitas — The Murderer’s Brain” the convolutions of a human brain, suspended in a clear glass jar, are almost hyperreal. The artist photographed the organ at the College of Physicians of Philadelphia’s Mütter Museum, which collects 19th-century medical oddities. In “Vanitas,” the jar sits on a thin slab of weathered stone. A piece of metal flashing splashed with cadmium red perches in the upper left corner, like a paper clip on a dossier. Below the red-streaked stone slab, an ivory gauge etched with numbers and markings hovers in black space. The gauge’s armlike pointer holds a red thread with a bronze drop at the end that seems to ground and stabilize the composition. Parker’s use of red unifies the formal elements in the piece into a calm kind of map and simultaneously suggests a violent underlying narrative. Each graphic element — composition, color, form and texture — invites the viewer’s eye to roam over the picture and inspect each curious crevice. Parker uses hyperreal resolution to draw viewers deep into her works and to suspend their disbelief. The artist shoots her images with a full-frame sensor digital camera. In other words, a very good one. Yet, for all their flawlessness, Parker’s works should not be seen as simply a “wowee-look-at-that-resolution” exercise. Her photographic sleight-of-hand is every bit as powerful as her camera. In “Two Peonies,” a work hung in the back room of the gallery, the white blossoms fairly burst with satiny petals, their powdery stamens multiple shades of yellow. The flowers hang over the edge of the recurrent stone slab, which in this piece sports a horse petroglyph and a small dark hole. Two tiny white threads disappear into the hole’s inky depths, heightening the sense of mystery in the piece. Above the frilled petals of the peonies, a window shape looms out of the black background, its rectangle flooded with sunrise colors. 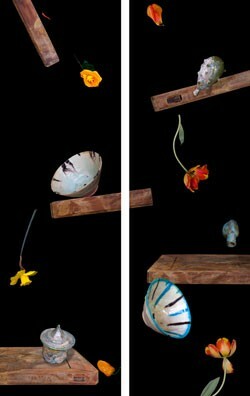 The piece feels roomlike; the stone platform, flowers and enigmatic symbols suggest a kind of altar. Like 17th-century still lifes, this work evokes both awe at the beauty of the rendered objects and a desire to decipher their meanings. Parker’s works reinvigorate the form and concept of still life while exposing the paradox of contemporary digital photography. She participates in the fevered innovations of the digital medium — the hunger for ever more pixels — while masterfully harnessing the equally sophisticated techniques available to manipulate images. The resulting photographs leave the viewer dazzled at the convergence of illusion and reality.